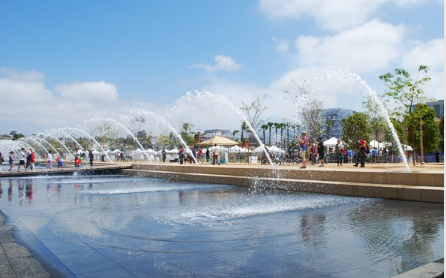 Despite an emphasis on their use of recirculating water, the fountains at the county’s new waterfront park in downtown San Diego splashed through more than 800,000 gallons of tap water during the first five months of this year, according to county figures. The fountains outside the county administration building are part of a $50 million park that opened in May 2014. Thirty-one jets spray 14-foot arcs of water into a shallow basin, where children can play and cool off. The fountains recirculate city tap water stored in underground tanks, but they lose more than 100,000 gallons each month to evaporation, filtration and treatment, according to county records obtained by The San Diego Union-Tribune under the California Public Records Act.